Are normal cameras not wide-angle enough for you? How does 360 degrees sound? A new gadget currently selling on Kickstarter aims to make 360-degree video and photography easy and fun — though not necessarily cheap. 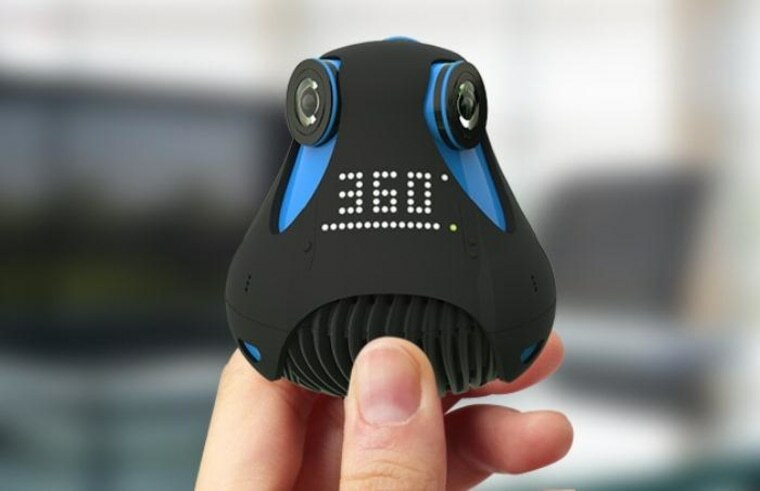 The 360cam, from French company Girpotic, has three cameras, each facing a different direction; together they form a complete view of everything around you. You can record video, take pictures and time lapses, or stream your surroundings live on the Web. There are apps for mobile and desktop, and the video is compatible with the usual software. It does look like a funky little gadget, and it's nice that it's waterproof and has a built-in screen, but we've had trouble with 360-degree devices in the past. The wide-angle lenses tend to introduce a lot of distortion, and the tiny sensors inside can't capture much detail, especially in low light. Of course, no one is trying to snag a Pulitzer with a picture from this type of device — it's for fun, and if you like the idea of strapping the thing to your head and giving the world a live look at your life, go ahead. The battery only lasts an hour, though, so make it count. Be ready to shell out: The retail price is expected to be $500. If you pre-order, you can get one for $300 (the $250 early bird special is sold out), but you'll be taking a chance on whether the device lives up to its promises.